Below is a list prepared by the late Protopresbyter Thomas Hopko that I have modified for our parishioners. Please consider working these into your daily lives (printable version attached). Have a manageable daily rule of prayer that is prayed faithfully. Say the Lord’s Prayer several times each day. Repeat the Jesus Prayer when your mind is not occupied. Attend Liturgy every Sunday and attend the other (non-Sunday) church services regularly. Reveal all your thoughts and feelings to your confessor regularly. Cultivate communion with the saints by reading about them. Listen when people talk to you (And put down your phone!). Be awake and attentive, fully present where you are (And put down your phone!). Don’t complain, grumble, murmur or whine. Don’t seek or expect pity or praise. Don’t judge anyone for anything. Endure the trial of yourself and your faults serenely, under God’s mercy. On July 5/18, 1918, St. Elizabeth was martyred by the Bolsheviks in Alapayevsk along with her companion, the Nun Barbara, as well as other members of the Romanov family. On most Wednesday evenings in 2018, we serve the Akathist Hymn for St Elizabeth in our parish. Attached here is the English translation of the Akathist, which can be printed for praying at home. Please click on the links below to read the full text of the beautiful and salvific prayers Kneeling Prayers (in English and Russian), which are read on bended knees during Great Vespers after the Liturgy on Pentecost. Also, there is an additional link which explains the reasons why we do not kneel from Pascha to Pentecost and why we beginning kneeling and prostrating in prayer on and after the feast of Pentecost. Often times the Rector is asked, “What must I do, or how must I live, to be a good Orthodox Christian?” One of the keys to understanding the answer to this question is to realize that we are not saved alone, but rather within the Church. This is why it is essential to be a member of a parish or a monastic brotherhood (or sisterhood). There is no such thing as a “free agent” or “independent” Orthodox Christian. No one is in a “special category” with some level of independence from the brethren as thinking that way about oneself only leads to self-delusion (“prelest” as the Fathers call it). So, with this important proviso in mind, here are the Rector’s “top ten” things to do in order to be a good, faithful Orthodox Christian. 1. Attend Liturgy every Sunday (and be on time standing attentively ready for the priest to proclaim: “Blessed is the Kingdom of the Father, and the Son, and of the Holy Spirit…”). 2. Go to Confession and Communion regularly. 3. Pray every morning, evening, and before and after every meal. 4. Read the scriptures daily. 5. Fast to the best of your ability according to the Church Calendar. 6. Tithe to the parish. 7. Offer your time to the parish and to your brethren. 8. Be grateful, cheerful, and cultivate a simple way of life. 9. Do not gossip or get unnecessarily involved in controversies. 10. Do not be self-directed in spiritual things, but rather seek guidance from your priest and faithfully work to follow his counsel. Christ is risen! Христосъ воскресе! The link below includes some of the stichera (verses) from the services of Matins and Vespers for the Week of the Samaritan Woman. 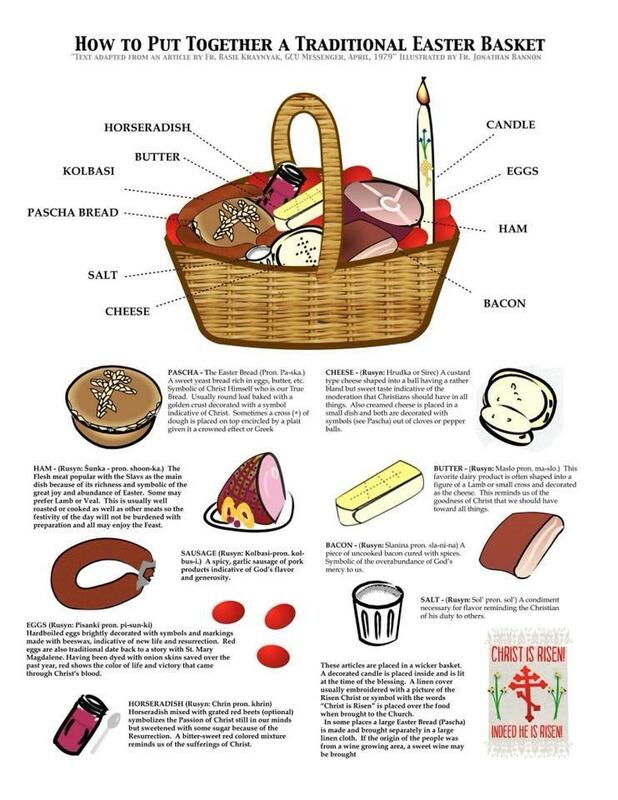 They are taken from The Pentecostarion, which is the special liturgical book used during this season of the year – Pascha through All Saints – for our worship and edification. The verses chosen focus on the glorious resurrection of Our Lord and how His resurrection changes our humanity and the very fabric of Creation. The link below includes some of the stichera (verses) from the services of Matins and Vespers for Thomas Week. They are taken from The Pentecostarion, which is the special liturgical book used during this season of the year – Pascha through All Saints – for our worship and edification. The verses chosen focus on the glorious resurrection of Our Lord and how His resurrection changes our humanity and the very fabric of Creation. The link below includes some of the stichera (verses) from the services of Matins and Vespers for Bright Week. They are taken from The Pentecostarion, which is the special liturgical book used during this season of the year – Pascha through All Saints – for our worship and edification. The verses chosen focus on the glorious resurrection of Our Lord and how His resurrection changes our humanity and the very fabric of Creation. 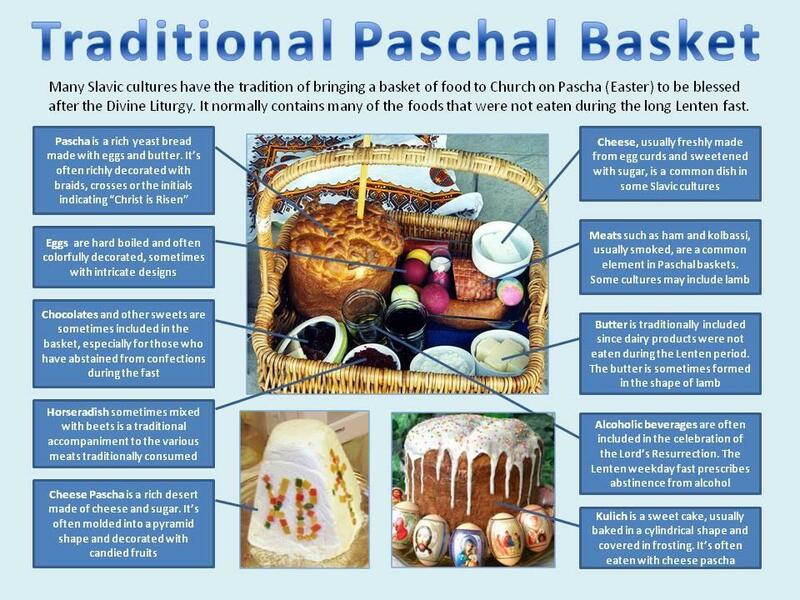 Here are some pictorial guides for putting together a traditional Pascha basket that might be helpful to you. Now that we have completed the 40 days of the Lenten Fast, it is time for us to transition from our Lenten “preparation” to “participation” in the Our Lord’s Passion and Resurrection during Holy Week. Attendance at the divine services is essential in this endeavor. In addition to the link below of the Holy Week Schedule of Services is a short essay to help in the understanding of the divine services entitled, “The Liturgical Meaning of Holy Week.” May this help you in your “participation” this Holy Week.